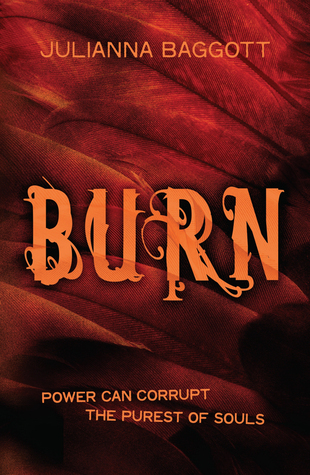 Burn is the final book in the Pure trilogy and therefore this review contains spoilers for Pure and Fuse. I heartily recommend that you give this trilogy a try! Partridge has taken his father’s place in the dome. This is his chance to bring about change. But it’s not as easy as he seems and whilst separated from his new friends, the tempers in and outside the dome are fraying. Burn highlights how replacing the person at the top doesn’t make it easy to change things. There are other people, existing prejudices and instability which means no matter how good your intentions, you might not be able to fix things. It might be a rather bleak story but it’s a refreshing change from rose-tinted world-building. Whilst Partridge’s precarious position within the dome was a far too believable scenario, I did think he was a bit too easily steered in some cases. I wanted him to resist more, to fight harder for Lyda, to maybe suspect people wanted them apart. That the plan to put him with Iralene wasn’t for the sake of the people at all. After El Capitan proclaimed his love for Pressia, it would have been all too easy to turn him against her and make him into someone else. But he is good and kind, a stark contrast to the character we were first introduced to. I had almost forgotten his past until it was brought up in the later stages. Him and his constant companion, Helmud, are still the best bits, even moving me to tears and keeping me on tenterhooks for their safety. Pressia is still worrying about Bradwell and his reaction to his transformation; one that she caused. I never felt their relationship was central to the plot though. This is one of the few trilogies where the switching viewpoints works and I am equally invested in each character’s story. The pace is fast throughout and it kept me up past my bedtime! I don’t it’s a conclusion that’s going to please everyone but it’s moving and dark and complex. The lines are blurred and there is some heartbreak. Yet there are some heart-warming moments amongst the ash and grief. It might be the end of Pressia’s story but there is so much more potential in this world I’d love a standalone from another point of view, following on from Burn or further on in the timeline. Burn is published by Headline and is available to buy now in hardback and ebook editions. Thanks go to the publisher for providing a copy for review. I wasn't overly keen on Pure so I haven't really been keeping track of this series at all. I thought I would welcome a more grown-up take on the dystopian trend and I do recognise that Baggott is a heck of a writer but I found everything a bit much after a while. It sounds like the series has ramped up a bit so I might actually give it another chance! Plus, it'd be nice not to have struggled through the graphic descriptions of the characters' mutations for nothing! The second book was the best one for me. I guess their fusings just become more normal so they're not talked about so much. The thought of it all in the first book was pretty gruesome and scary. Great review, Ellie! I totally agree about El Capitan and Helmud. My favourite characters. This was my least favourite of the trilogy, not helped by the fact that I really didn't enjoy the Partridge/Lydia story, but the ending was satisfactory. All in all, though, a great series. I still prefer the first book because of discovering this whole new bizarre world - Baggott's world-building is excellent - but liked Burn more than Fuse. Really though, the three are just beginning, middle and end of the one story and it's sad to come to the last page. There seem to be a lot of reviews out for this right now - so I'll add a link to this on mine at OurBookReviews.